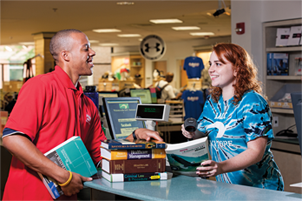 We have created this area of our Web site to answer some of the most frequently asked questions our faculty have about the AACC Bookstore and the textbook/course materials ordering cycle. We hope you find the information to be useful. If there are any questions that are not addressed here, or you have any concerns or suggestions regarding your textbook orders, related course materials, or any other AACC Bookstore products and services please let me know. Your feedback is always welcome. The college and the bookstore are at the forefront of ensuring course materials remain affordable; we want you to be as informed as possible when making your course materials decisions. We have designed this site to provide you with many resources to help you understand your rights, duties and responsibilities under federal and state law and assist you with locating further resources to help you select your course materials. Additionally, the following links provide summaries or full-text listings of relevant bills and acts. National Association of College Stores HEOA Informational Pages The 2009 presentation PDF provides a good summary. Open educational resources (OERs) are gaining ground at all levels of education in the U.S., their acceptance spurred by the cost savings they represent for students and parents hard-pressed by the price tag for a college education. OERs are teaching and learning materials that can be used and reused — often adapted and shared as well — for a low cost or free of charge. That can help keep students on a path to academic success by making sure they have all their required course materials rather than forgoing purchase of some or all due to costs. Open content takes many forms, including print books, digital books, online modules, and videos. The landscape includes many producers and distributors, large and small, for-profit and nonprofit, with varying motivations. New start-ups are rolling out platforms to support OERs that include interactivity, analytics, assessment, and integration with schools’ existing learning management systems (LMS). Some also feature content curation and peer review, which may begin moving more faculty members past the perception that free or low-cost is synonymous with low-quality. We have created a series of pages to provide you with further information and links to additional resources regarding OERs, including information regarding the history of OERs at AACC. Please click the link below to visit the AACC Bookstore's OER Information pages. We have also created a page with answers to the most frequently asked questions that also provides information of a general nature, not specific to adoptions or legislative issues. Within the bookstore, certain staff hold specific positions directly relevant to course materials or are designated as subject matter experts on other topics with which faculty may need assistance. Please follow the link below to a directory of our staff members who will be happy to assist you with anything that you require.